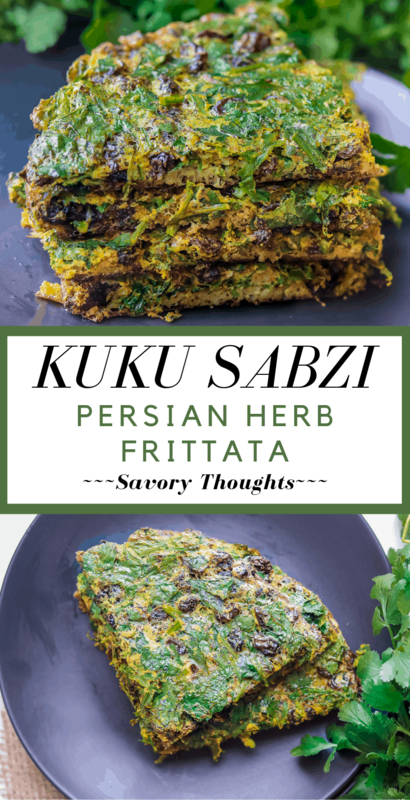 Kuku Sabzi – Persian Herb Frittata – Elegantly served as an appetizer or a main dish. Kuku or Kookoo Sabzi is one Persian recipe dish to try. A healthy Iranian food recipe casserole that’s mixed with fresh green herbs, eggs, fruits, and nuts. A delicious Sabzi recipe, Mediterranean dish that’s a MUST have on your recipe repertoire. 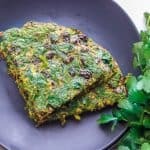 Why Does This Kuku Sabzi – Persian Herb Frittata Recipe Work? Unlike traditional frittatas, the star of this dish is not the eggs but rather the herbs that are used. It is made with less eggs, but just enough to keep the ingredients together. This Persian frittata is served for breakfast, lunch, dinner, or as an appetizer. Works well lamb as part of the main dish. Works well with tzatziki as an appetizer. One pan dish. Therefore, no need to dirty extra dishes. Healthy and is perfect for Meatless Monday. Kid friendly. Even my pickiest eater had seconds, and ask me to make more from time to time. A kuku is a Persian-style frittata and is often served at Persian New Year. 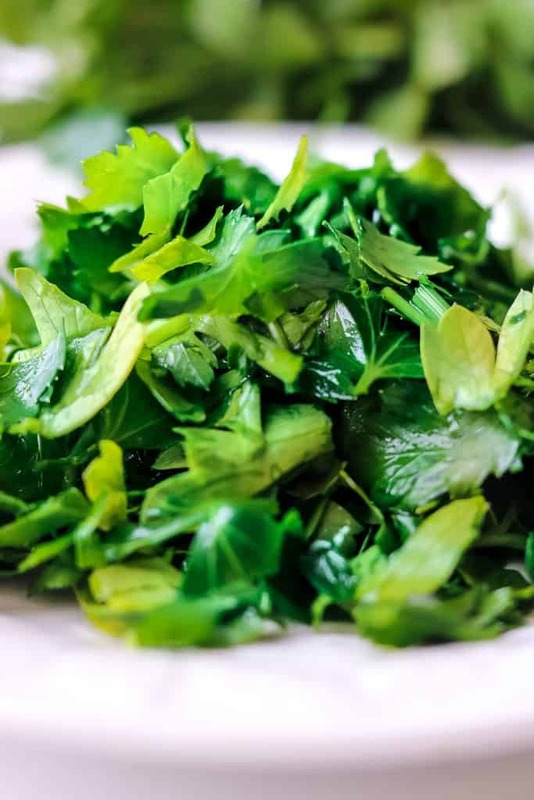 Sabzi means herbs (or greens), and any greens you may have on hand will satisfy the meaning. The key is to keep all of the ingredients, clean, fresh, and healthy. Persian New Year or Nowruz is the way Persians celebrate the beginning of a new year and they serve this dish. What Is The Difference Between Kuku And Frittata? The difference between Kuku and a frittata is the number of eggs that are included in the dishes. The main ingredients in Kuku are the herbs, whereas, in a frittata, the main ingredients are eggs. Similarly to frittatas, all of the ingredients are combined in one bowl, then cooked together in the oven; sometimes on the stove then transferred in the oven to bake. How to Make Kuku Sabzi? First, pre-heat the oven to 350 degrees (Baking powder not photographed). Second, wash all the herbs. Once they’re washed and dried, chop the herbs very thinly and place them in a large bowl, then add all of the remaining ingredients. Mix all the ingredients together and transfer the ingredients to a cast iron skillet, or oven-safe skillet. Bake for 25-30 minutes, or until a toothpick comes out clean from the center. Allow cooling. Serve as an appetizer, breakfast, lunch or dinner. Did you make this Kuku Sabzi recipe? Tag me on Instagram or Facebook and please give it a star rating below! SAVE THIS PERSIAN FRITTATA RECIPE TO YOUR PINTEREST BOARDS! 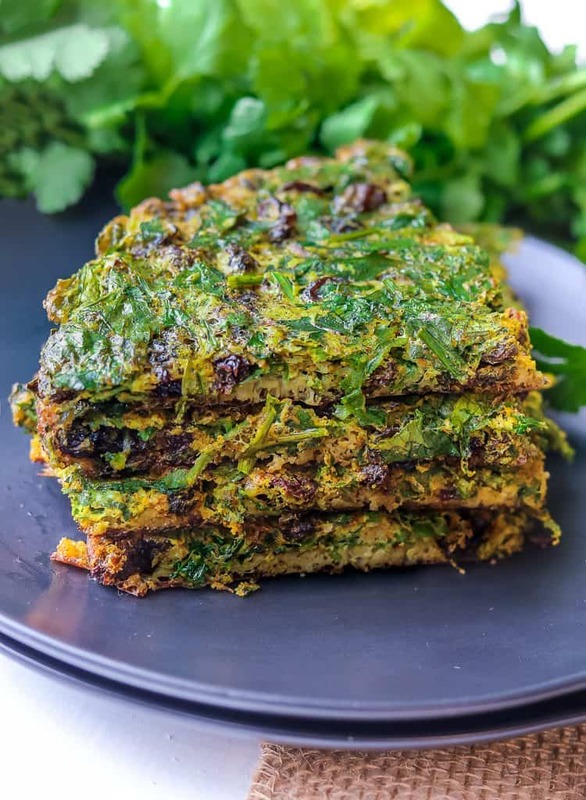 Kuku Sabzi – Persian Herb Frittata – Elegantly served as an appetizer or a main dish. Kuku or Kookoo Sabzi is one Persian recipe dish to try. A healthy Iranian food recipe casserole that’s mixed with fresh green herbs, eggs, fruits, and nuts. A delicious Sabzi recipe, a Mediterranean dish that’s a MUST have on your recipe repertoire. Kuku sabzi can also be cooked on the stove. I have never made this dish over the stove as I find baking is easier. Persian cuisine is very rich as it is hearty and is full of fresh ingredients. This meal is also great with lamb. This dish is packed with fresh herbs which makes it high. This kuku dish is also rich in minerals, vitamins, and antioxidants. It contains healthy fats, and also provides Vitamin K, Vitamin A, calcium, potassium, magnesium, selenium, and iron to name a few. I just love frittatas! They’re so easy to whip together, and this recipe sounds so divine! Could eat a frittata any time of day or night! Oh what a fun idea that the herbs are the star of the show – my oldest is obsessed with anything herb based – she eats them right out of the garden plain. She will love this! I have never had kuku but I love learning and tasting new things. I’m sure the herbs really shine in the dish. I have never tried a frittata like this before. Look at all the green in this recipe. I think I just might have to make this as part of the weekend brunch menu and give it a try. Oh, I love, love a good brunch, and spring always makes me extra excited from brunch! There’s something about all the brunching holidays coming up that bring it out of me. With all the fresh herbs, this frittata is absolutely perfect for a nice spring brunch! WOW OH WOW does this frittata look PHENOMENAL!!! The addition of raisins is insanely unique too! I am all about the herbs. It just makes any dish taste so much better. I like a normal frittata, but I know I would LOVE this! Love how packed with herbs these are. I may have to sub something from the cilantro (basil, maybe?) but otherwise I can’t wait to make this. This is a very new recipe that I found. Really unique and must try! Here is another fun recipe I need to try asap. I love frittata and adding raisins to fresh herbs sounds delicious. This was super tasty and simple to make! Love the spices and the raisins! I love making frittata and this recipe was a hit!! Loved all of the flavors and herbs! ive never had this before, but what wonderfully great fresh flavors!! it would be a perfect accompaniment for so many dishes. Yes, and definitely not a traditional frittata. Such an interesting recipe! I’ve never tried this dish before, but I must! Sounds delicious. This is such a unique recipe, you wouldn’t think that raisins and eggs go together, but it’s delicious! The slightly sweet touch makes for such a tasty appetizer or light dinner. ha-ha yes, who knew! But they work well together. Enjoy! Yum! We made this and loved the fresh herbs and raisins! So good with lamb, per your suggestion. 🙂 🙂 Will make again! This Persian frittata sounds delicious! 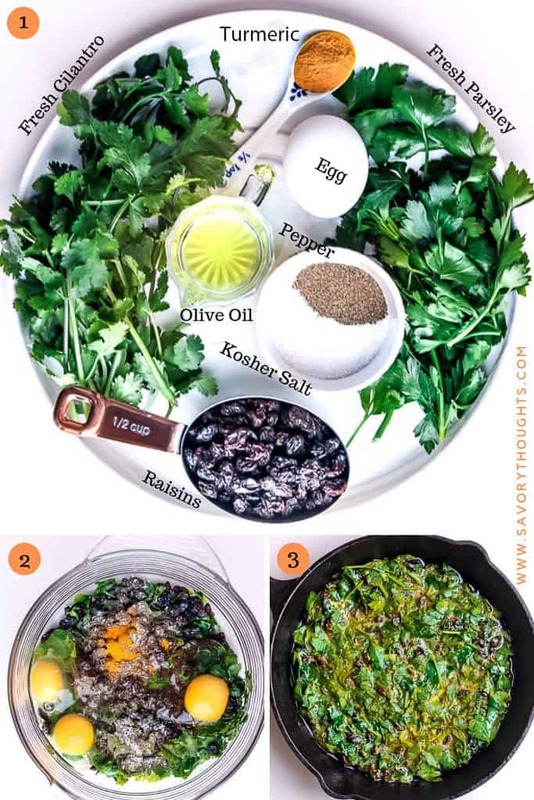 Love the idea of combining herbs and raisins. Here in Italy we make a lot of frittata but as you say it’s different. Going to try this asap! I love my fresh herbs so I really enjoyed how the herbs were the star of this dish! This is a unique recipe – it was delicious! I would like to try kuku sabzi without the raisins( just my preference). The green herbs makes this frittata unique,… let go green 😉. Go Green! Hope you enjoy it. Thank you for the origin lesson! I love finding out where and why certain foods came to be. And I appreciate how herbilicious this is! Me too! It makes the dish even more interesting. Thank you, Jori!